Food, fashion and free phones? What’s a Samsung smartphone launch really like? Blue laser show at Benelong at the Sydney Opera House. One of the most common questions fielded by UnderCurrent is, ‘What’s a Samsung launch really like?’. The Korean company famous for its market-leading smartphones, TVs and home appliances seems to have a bottomless pit of money to fund its PR budget, often buying its way into the mainstream media social pages through the use of bright lights, sporting personalities and pop idols, normally of the TV talent show variety. This has led to some querying from the peanut gallery as to what exactly goes on at these events, how much fun are they really and, the most common question of all, ‘What’s the food like?’. 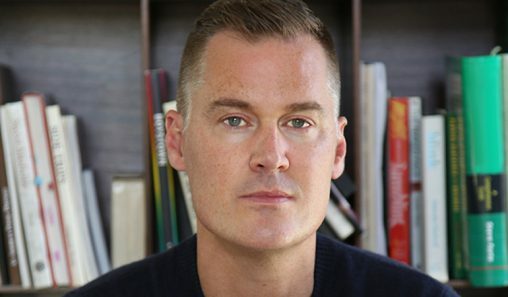 Samsung’s marketing head honcho Arno Lenoir. 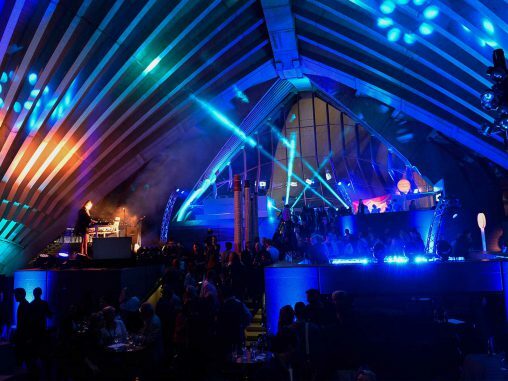 UnderCurrent arrived at the Samsung Presents the Sydney Opera House on the evening of the Galaxy Note 4 launch just as the sun was setting over the Samsung Sydney Harbour. The setting was Benelong, the blank space open plan room under the Sails vacated by the sudden and controversial departure of Guillaume restaurant at the end of 2013, after the Trust decided to move away from a fine dining tenant (Guillaume’s owner, Guillaume Brahimi is Samsung’s cooking appliance spokeschef: UnderCurrent wonders if this is awkward). 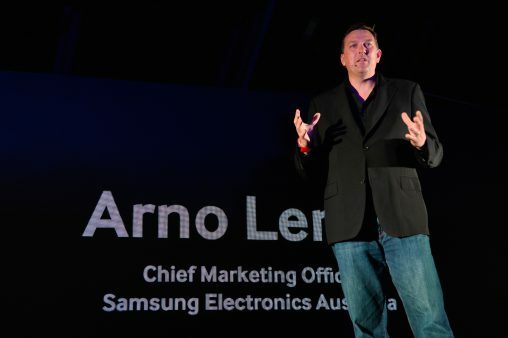 The media briefing was being held in advance of the official party, so only the myriad geeks, bloggers, vloggers, journalists, not journalists, Proper Journalist, rival hacks and UnderCurrent were in attendance to hear Samsung chief marketing officer Arno Lenoir speak about how excited he was to be launching the new products in Australia. 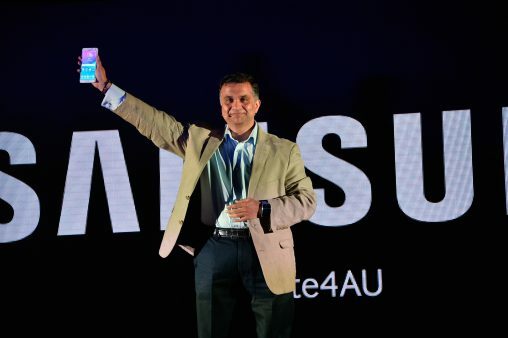 Lenoir almost immediately handed the mic over to Prasad Gokhale, vice president of IT and Mobile, who showcased the Note 4; the Note Edge (the only smartphone on the market with seven sides); the Gear S smartwatch; and, to a fairly spirited round of applause, at least by Australian technology media product unveiling standards, the Gear VR, which is a virtual reality headset built in partnership with the Facebook-owned Oculus, marketers of the Rift gaming device. Prasad Gokhale’s big reveal resulted in a sizable cheer. Gokhale then tagged in Steve Zagari, head of field operations for retail and enterprise, a title UnderCurrent wryly observes is a very long way of saying ‘sales’. Zagari spoke about how Australia is receiving these devices so quickly — they were only unveiled earlier this month at IFA in Berlin — as a reward for being such great early adopters. To complete the circle — and Circle is the name of Samsung’s Bluetooth wearable headphones — Lenoir returned to press play on a new video that has been developed specifically for Australian Gear VR consumption, with help from Samsung’s creative agency, Leo Burnett. The video appeared to be of the Great Barrier Reef — at the very least it was underwater — but UnderCurrent and the other journalists were distracted because Samsung’s PR agency, Edelman, had just emailed out the media release with the pricing and availability and everyone was eagerly reading it on their brand-spanking new iPhone 6es. Well, not every journo: Edelman furnishes its favoured media outlets with the releases ahead of time and often invites selected scribes to play with the new devices before anyone else gets a chance to. Although UnderCurrent is fairly certain — almost completely, in fact — that there are no written or spoken agreements, there is definitely an understanding that this special treatment will result in advantageous coverage. And, hey presto, when the clock strikes the embargo time, these outlets all immediately publish their broadly positive, voluminous articles, much to UnderCurrent’s chagrin. With the first set of formalities over, UnderCurrent was finally free to responsibly enjoy a refreshment. Guests were served Coopers Pilsener, Pure Blonde, a fairly decent red, an even better fairly decent white and champagne. Canapes were by ARIA Catering and included ocean trout tacos, pickled heirloom carrots with goat cheese and celery salt, mushroom risotto balls, rare roast beef on croute with beetroot and shimeji mushrooms, pulled pork panini with smoked mozzarella and tomato, mini wagyu burgers with tomato, aged cheddar and pickles, fish and chips, lamb cutlets with mushy peas, Nutella and coconut popping balls and macaroons burgers of strawberry and caramel. Whilst not in the absolute elite of canapes enjoyed by UnderCurrent in its vast hors d’oeuvre consumption experience, it was certainly enough to sate most parvenu diarists. 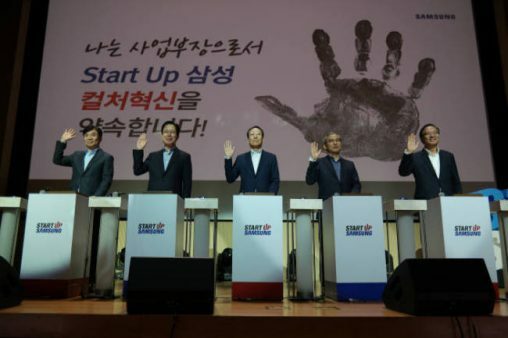 During the face-stuffing lull in proceedings, UnderCurrent had the opportunity to speak with a well-placed source from Samsung’s cache of consulting agencies. This source said the marketing spend for the new range would not match that of the Galaxy S5 from earlier in 2014. That campaign, built around the slogan ‘Made For Australia’ ran ad nauseam through the first half of the year with near saturation coverage — admittedly a great way to subliminally showcase the water resistant Galaxy S5’s ability to withstand saturation — and featuring hot young things enjoying our mild subtropical climate while wearing next to nothing; each spot concluding with the curious tagline, “You’re either on GS5… (and then a long pause) …or you’re not”. That line always sounded a little bit too George W Bushy to UnderCurrent and it’s pleased to report the very sharp operator it was discussing this creative with agreed. Of course, ads are best measured by resulting sales and UnderCurrent must congratulate Samsung on securing 40.6 per cent market share for the three months to July 2014. But UnderCurrent digresses because at 7:30pm, Samsung Electronics Australia president Jack Kwan took the stage to welcome all the lifestyle media, assembled reality show contestants, Samsung’s stable of sponsored sports stars, D-though-Z listers UnderCurrent can never recognise and even some of the really important journalists from Fairfax, News Corp and Everything For The Man. “Welcome to the [Samsung Presents the] Sydney Opera House for tonight’s event,” welcomed Kwan. 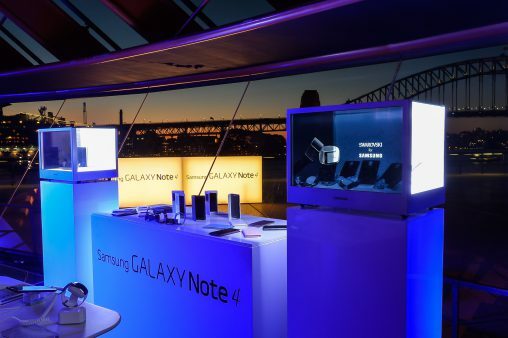 “As a principal partner of the [Samsung Presents the] Sydney Opera House, Samsung is delighted that you can join us at this Australian landmark as we unveil our latest products. Kwan then introduced Lenoir back up to the stage to give an abridged version of his earlier speech. “It’s a great turnout, I can’t see people in the back but I can see silhouettes so that must mean there are a few people up there,” Lenoir said. UnderCurrent would like to confirm that the turnout to this event was spectacular. Whether it was the inchoate hope/incorrect assumption that they would be leaving with a free phablet, a la previous Samsung launches, or it was the appeal of a crepuscular seat to the best view on the planet, or simply just the chance to check out a 7-sided smartphone, this launch drew a rare crowd. No, Lenoir was not talking about the food, he was talking about the Gear VR, the virtual reality headset co-developed with Oculus that looks like a pair of 1980s-era NBA prescription goggles affixed onto to the straps of the Hannibal Lector mask from The Silence of the Lambs. UnderCurrent quickly checked with its retained healthcare professionals that it wasn’t “pregnant, elderly, [having] pre-existing binocular vision abnormalities or psychiatric disorders, [suffering] from a heart condition or other serious medical condition or [having] had a seizure linked to an epileptic condition” and assured that it was at least the minimum 13 years old, it strapped on this brave new world in wearable content submersion to experience the future! 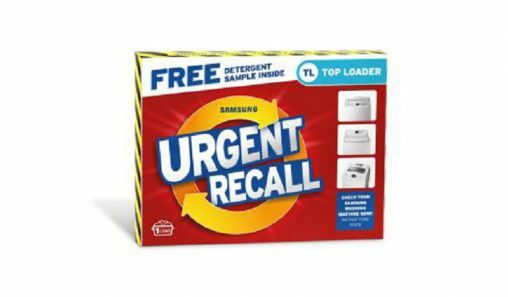 And let UnderCurrent assure you, this product is something special. UnderCurrent soared over Manhattan Island, hot air ballooned in Turkey, lazed with lions in the Serengeti and swam the oceans with the most beautiful benthic beasts (and ‘benthic’ is the perfect adjective for UnderCurrent) — all while sipping white wine and relaxing in one of those really comfy hemisphere lounge chairs that you just fall into. The vision may have only been B-Roll but it was A-Grade. As much as UnderCurrent thoroughly enjoyed the Gear VR experience, and it can proudly report no “visual abnormalities, dizziness, disorientation, nausea, discomfort or pain, or any symptoms similar to motion sickness”, it is intrigued by how totally dependent this virtual reality wearable is on the Galaxy Note 4. The handset actually slides into a cavity in the Gear VR, and only the Galaxy Note 4 can fit. Usage of the Gear VR is entirely linked to the Galaxy Note 4 — there is no backwards compatibility — and no futureproof assurances. It is as limited as it is wonderful. The Gear VR would make a great product to have in-store to attract and engage with foot traffic, and it’s possible that a customer would splurge the combined $1,198 for the set, but UnderCurrent sees this more as a bridging device: one that provides a tempting glimpse into the near future, when virtual reality headsets have more native content, work with more devices and have an increased level of brand agnosticism. After experiencing the Gear VR, UnderCurrent accidently mistook James Magnussen for Eamon Sullivan, enjoyed a blue strobe lightshow and then met a bright young thing invited by Telstra because he has 15,000 followers on the Twitter and the telco hoped he would regale those fans with a series of positive tweets. Always a responsible diarist, UnderCurrent took a cab home to its cave. A beautiful shot of the Harbour Bridge, behind Samsung’s new wearables.